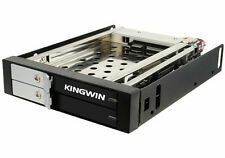 KINGWIN, 5.25" bay for 3.5" SATA HDD, Internal Tray-Less, Hot Swap Rack, NEW. Condition is New. Shipped with USPS Priority Mail. 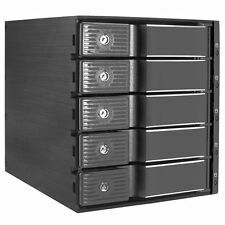 New ListingKINGWIN KF-255-BK.HOT SWAP RACK.2,5"/3,5" HDD/SSD INTERNAL TRAY-LESS. Kingwin KF-255-BK.2,5/3,5" HDD/SSD INTERNAL TRAY LESS. HOT SWAP RACK. NEW. Sealed. Kingwin KF-21-IPF Mobile Rack Drive Tray, IDE, Beige. 3.5” IDE, Ultra ATA 66/100/33. Fan. Condition is Used (lightly). Shipped with USPS Priority Mail. King win HDD Power Switch Module, 6 Switches for 5.25". Reduce energy & extend HDD life. Blue LED Indicator for HDD working status. Power ON/OFF HDDs that are not in use. 2.5" SATA HDD USB 3.0 black aluminum alloy external enclosure. Light weight aluminum alloy enclosure. Application: 2.5" SATA HDD. HDD Capacity: 1 TB. Interface: USB 3.0 to SATA. Material: Aluminum alloy. Dual-Bay 2.5”/3.5” SATA HDD & SSD Docking Station. HDD Interface: 2.5”/3.5” SATA I/II/III Hard Disk Drive (HDD) or Solid-State Drive (SSD). Product Type: SuperSpeed USB 3.0 Dual-Bay SATA Drive Docking Station. Suitable hard disk type 1.0" or 1.6" height 3.5" Serial ATA HDD. Manufacturer: Kingwin. Black from the front and Silver aluminum body. Two USB 3.0 hub on front. Part Number: KF-256-BK. Manufacturer: Kingwin. This slick tray-less enclosure allows SATA drive hot-swap and includes a front cover door, air vents, Power and HDD access LED indicators, and key lock protection for securing your hard drive. Included all accessory, 4pcs SATA cables, bag of screws. Easily transportable. Kingwin Support Center. Direct SATA to SATA bridge connection for the fastest data transfer. Supports SATA I & SATA II. Aluminum and ABS Plastic. Product Link. 1 Year Manufacturers. Rack only, does not include Hard Disk Drive. Fan: 1 x rear ball bearing fan 40 x 40 x 10 mm. But there will be rare occasions when my best efforts are not enough and the item you have received has problems. I am easy to work with. Color: Black Face / Aluminum Body. ATA 100/133 Support. Built In Bottom Fan | DIN41612-64Pin Connector. Whole Aluminum Body. About This Item. Manufacturer: Kingwin. Hot-Swap capable. Key Lock, and made with top-notch quality materials. Supports SATA I / II / III HDD /SSD. Part Number: KF-250-BK. Manufacturer: Kingwin. Kingwin's KF-255-BK refreshed version KF-252-BK (logo is located in the back). Led light for power & HDD activity. 2.5" or 3.5" SATA internal hot swap rack. SATA to IDE bridge board; converts all SATA to IDE. Convert all SATA devices to IDE. Two LED indicators for "power on" (green) and "HDD" (red). Kingwin KF-21 Mobile Rack Drive Tray, Black, IDE. Complete unit (Carrier, tray, keys). 3.5” IDE. Ultra ATA 66/100/33. Fan. Condition is Used (lightly). Shipped with USPS Priority Mail. KINGWIN SATA Mobile Rack KF1000BK SATA 3.5 Internal HOT SWAP RACK NEW. Condition is New. Shipped with USPS Priority Mail. This is appears to be new but the box was opened. Manufacturer: Kingwin. 2.5" / 3.5" SSD & SATA Docking Station. Supports SATA III 6 Gb/s. Manufacturer: Kingwin. Extra inner tray for KF-91/92-BK. For standard 1" or 1.6" height, 3.5" HDD. This is new and still sealed in the original plastic. Kingwin KM-U3NGFF SuperSpeed USB 3.0 to NGFF M.2 B Key SSD Enclosure Compatible with SATA-based B key SSDs. SuperSpeed USB 3.0 to NGFF M.2 SSD Enclosure. Drive Installation: Fixed Enclosure Casing (includes mini-screwdriver). An internal SATA Hot-Swap enclosure with instant HDD installation, Hot-Swap ability, and unlike any other units you will ever encounter. KF-1000-BK has made it simple, easy, and convenient to maximize your storage capability. Kingwin's KF-255-BK refreshed version KF-252-BK (logo is located in the back). Led light for power & HDD activity. 2.5" or 3.5" SATA internal hot swap rack. Fits in one 51/4 drive bay. New in Open Box. Build In Bottom Fan. Whole Aluminum Body. Inner Tray Only. There is no local pick up. We are always updating our catalog with new and exciting products. Get yours, Order now! The inventory is updated and monitored regularly. Kingwin OEM Device. PC Interface: eSATA / USB 2.0. eSATA Cable. Black aluminum external enclosure. Type: Hard Disk Enclosure. Enclosure Material: Aluminum. 3.5" Aluminum Enclosure. Enclosure Holder/Stand. Kingwin, KF-81-T-BK, Mobile Rack, Black, New, Sealed. 2.5″ SATA/SSD HDD USB 3.0 black aluminum alloy external enclosure. Light weight aluminum alloy enclosure. Application: 2.5″ SATA/SSD HDD. Interface: USB 3.0 to SATA. Color: Black. Material: Aluminum alloy. Maximize your storage capability with ultimate ease by choosing the Kingwin Internal Hot Swap Rack. 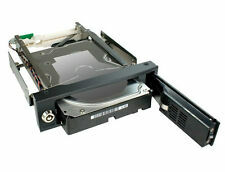 This hot swap rack is suitable for 3.5" hard disk type. It transfers data safely through its SATA interface. Currently mSATA SSD are available up to 1TB of storage with sequential read/write performance reaching 500MB/sec. The KM-U3MSATA adapter board allows you to easily insert the mSATA module thru the 52-pin SSD connector and push it downwards to fasten. 2.5" / 3.5" hard drive docking station. SATA to USB 2.0 and eSATA with one touch backup. 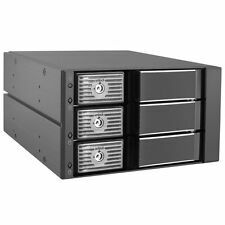 KINGWIN KF-255-BK.HOT SWAP RACK.2,5"/3,5" HDD/SSD INTERNAL TRAY-LESS.